To Cite: Cengiz M, Ozenirler S, Yılmaz G. Estrogen Receptor Alpha Expression and Liver Fibrosis in Chronic Hepatitis C Virus Genotype 1b: A Clinicopathological Study, Hepat Mon. 2014 ; 14(9):e21885. doi: 10.5812/hepatmon.21885. Background: Hepatic damage due to chronic hepatitis C virus (HCV) genotype 1b infection varies widely. Objectives: We aimed to investigate whether estrogen receptor alpha (ERα) plays a role in liver fibrosis in patients infected with HCV genotype 1b. Patients and Methods: All the consecutive patients who received the same standard treatment protocol for HCV genotype 1b were subdivided into two subgroups according to their fibrosis scores as fibrotic stages < 2 in mild fibrosis group and fibrotic stages ≥ 2 in advanced fibrosis group, depending on the presence of septal fibrosis. ERα was stained in liver biopsy specimens. Demographics and clinical properties were compared between the groups. Multivariate logistic regression analysis was performed to predict advanced fibrosis. Results: There were 66 patients in the mild fibrosis group and 24 in the advanced fibrosis group. Among the mild and advanced fibrosis groups, 65.1% and 50%were female, respectively (P = 0.19). There was an inverse correlation between ERα and fibrotic stage (r: -0.413; P < 0.001). Age, platelet counts, neutrophil counts, Alanine aminotransferase (ALT), Aspartate aminotransferase (AST), Gamma glutamyl transferase (GGT) and ERα were statistically significant in the univariate analysis. In multivariate logistic regression analyses, ERα expression continued to be an independent predicting factor of liver fibrosis in patients infected with chronic HCV genotype 1b (OR: 0.10; 95% CI: 0.018-0.586; P < 0.001). Conclusions: ERα expression in liver was inversely correlated with liver fibrosis among patients infected with chronic HCV genotype 1b. Chronic hepatitis C virus (HCV) is a common and important cause of chronic liver disease. Hepatic damage due to HCV varies widely; while some patients show little liver fibrosis progression even for decades, others progress to cirrhosis in a short time. Some viral and host factors such as male gender, age, alcohol intake (1, 2) and genotype 1b (3, 4) may affect the rate of fibrotic progression in chronic HCV. By the time, it has become pronounced that males develop more progressive liver disease than females and observations have indicated that there have been some differences related to gender in an HCV infection situation and liver histopathology (5). Some studies have suggested that the low antiviral response rates may be due to low estrogen levels and estrogen agonists directly protect the hepatocytes and control liver fibrosis (6, 7). Estrogen receptor (ER), a steroid hormone receptor, is a subgroup of the the nuclear receptor family. There are two different forms of estrogen receptors, usually referred as α and β, each of which is encoded by different genes (8). ERα has high expression in many different cell types and the association of low expression of ERα and oxidative damage has been shown (9). Low expression of ERα has been demonstrated in rat hepatocytes in hepatic fibrosis model and primary culture (10) and experimental data from rat models have shown protective effects of estrogens on liver fibrosis (11). In addition, drugs targeting the host proteins required for chronic HCV, nuclear receptor or antireceptor antibodies may be more helpful in the fight against viral infection (12) and the role of ERα in regulation of HCV replication has been reported (13). Tamoxifen and other antiestrogens suppress genome replication through interaction of ER with endoplasmic reticulum and HCV RNA polymerase NS5B (13) and that is why ER is suggested to be a new therapeutic target for chronic HCV. In the present research, we aimed to evaluate the association between hepatic expression of ERα and hepatic fibrosis among well-organized and characterized patients infected with HCV genotype 1b. We investigated whether ERα expression can be a novel therapeutic target to inhibit fibrosis progression due to HCV genotype 1b infection. All the consecutive patients infected with HCV genotype 1b who had received the standard treatment protocol (Pegylated Interferon α2a (PEG-IFNα2a) + ribavirin (RBV)) and had undergone liver biopsy in the Gastroenterology Department of Gazi University Faculty of Medicine between May 2008 and November 2013, were enrolled in the study. The participants were included if their serum transaminase levels had persistently elevated for at least six months and their liver biopsy specimens were compatible with chronic HCV, had anti-HCV antibody and HCV-RNA, were infected with HCV genotype 1b, had high serum level of HCV RNA (> 5.0 log IU/mL), and received the standard treatment protocol. Other genotypes of HCV (genotype 2-4), positive serological markers for hepatitis B virus, seropositivity for anti-HIV antibody, chronic alcohol consumption in excess of 20 g/day, histopathological features associated with autoimmune or metabolic liver diseases, presence of hepatocellular carcinoma, presence or past history of venous thrombosis, severe cardiac and/or renal diseases, usage of immunosuppressive agents, any hepatotoxic medication, or noncompliance to the treatment protocol for chronic HCV genotype 1b (PEG-IFNα2a + RBV) were considered as exclusion criteria. Demographics, clinical information regarding HCV and comorbid conditions were retrospectively recorded by a physician blinded to the data of the patients for bias prevention. Percutaneous liver biopsies were performed using disposable Menghini (Hepafix 16 gauge; Braun Melsungen AG, Melsungen, Germany) type needles by a skilled clinician. The biopsy specimens of the liver tissues, longer than 20-25 mm and at least with 12 complete portal triads, were fixed in 10% formalin buffer and stained with hematoxylin and eosin (H&E) and Masson trichrome. 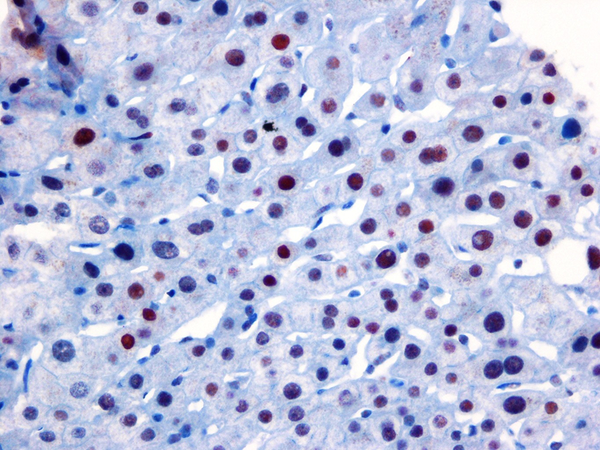 The liver biopsy specimens were also stained immunohistochemically for detecting ERα expression. From the paraffin blocks, cross-sections were obtained to assess the estrogen receptor α expressions. An automated system and streptavidin-biotin triple indirect immunoperoxidase methods were used for immunohistochemical staining. The IgG type and monoclonal character (Santa Cruz Biotechnology, California, USA) antibodies were used for ERα. ER-positive breast cancer tissues, as a positive control group, were compared with the stained samples. Among all the ER-positive cases, nuclear ERα expression percentages and degrees were calculated by counting at least 1000 cells at randomly selected 10 fields under high magnification. According to the percentages and degrees of the histological stain recorded blindly (ERα expression), the severity was considered as low expression ERα, as seen in Figure 1, and high expression, as demonstrated in Figure 2. All the biopsy specimens were analyzed by one hepatopathologist who was skilled in hepatopathology, blindedly. Liver inflammation and fibrosis were assessed in accordance with the Metavir scoring system. Liver fibrosis was staged on a scale of F0 to F4 (F0, no fibrosis; F1, portal fibrosis without septa; F2, few septa; F3, numerous septa without cirrhosis; F4, cirrhosis). According to this classification, fibrotic stages < 2 were classified as mild fibrosis group and the patients who had fibrosis stages ≥ 2 were classified as advanced fibrosis, depending on the presence of septal fibrosis. Figure 1. Low Expression of Estrogen Receptor α in the Livers of Patients Infected With Hepatitis C Virus Genotype 1b. Figure 2. High Expression of Estrogen Receptor α in the Livers of Patients Infected With Hepatitis C Virus Genotype 1b. Reverse transcriptase PCR was used for determining the serum HCV-RNA levels by a commercial kit (MagAttract virus mini M48 kit, RealTime™ HCV amplification reagent kit, Abbott) and anti-HCV antibodies were determined by ELISA chemiluminescence (Tarrytown, NY, USA). Genotype analysis of all the subjects was performed using the line-probe assay (Innolipa) strip method and the patients who were infected with HCV genotype 1b were enrolled in the study. The individuals who had undetectable serum HCV RNA in the 24 weeks of therapy were designated to have sustained virological response (SVR). The research was carried out in accordance with the 1975 Declaration of Helsinki, updated in 2008. The Institutional Review Board of Gazi University Faculty of Medicine approved the study protocol. All the statistical analyses were performed using SPSS version 21 (SPSS Inc., Chicago, IL, USA) and MedCalc version 12.7 (Mariakerke, Belgium). The variables were investigated using visual (histogram, probability plots) and analytical methods (Kolmogorov-Smirnov/Shapiro-Wilk’s test) to determine whether or not they are normally distributed. Descriptive analyses were presented using medians ± (min-max) for non-normally distributed variables. Where the quantitative variables were normally distributed, the results were represented as mean ± standard deviation (SD). The frequencies were calculated for categorical variables. The correlation coefficients and their significance were calculated using Spearman/Pearson tests, which where appropriate. The univariate analyses to identify variables associated with fibrosis F2 or greater among patients were investigated using chi-square, Fisher exact, student’s T and Mann-Whitney U tests. For multivariate analysis, the possible factors identified with univariate analyses were further entered into logistic regression analysis to determine independent predictors of the presence of F2 fibrosis or greater (depending on the presence of septal fibrosis). Hoshmer-Lemeshow goodness of fit statistics was used to assess the model fit. A 5% type-1 error level was used to infer statistical significance. According to the inclusion and exclusion criteria, 90 consecutive patients infected with HCV genotype 1b were enrolled in the study, 61.1% of whom were females. While 66 patients (73.3%) were classified as the mild fibrosis group, there were 24 patients (26.7%) in the advanced fibrosis group. In the mild and advanced fibrosis groups, 65.1% and 50% of patients were female, respectively. There was no statistically significant difference depending on gender (P = 0.19) among the fibrosis groups. When we compared the presence of SVR between the groups, there was no statistically significant difference (25% vs. 34.8% and P = 0.38). Regarding the presence of diabetes mellitus (DM) and hypertension (HT), there was no statistically significant difference between the two groups (P = 0.52 and P = 0.79, respectively). In the advanced fibrosis group, the mean age was 60.88 ± 10.86, while it was 54.08 ± 11.86 in the mild fibrosis group (P = 0.01). Clinical properties and demographics of the fibrosis groups are presented in Table 1.
a Abbreviations: ALP, alkaline aminotransferase; ALT, alanine aminotransferase; AST, aspartate amino transferase, ; BMI, body mass index; ER, estrogen receptor; GGT, gamma glutamyl transaminase; HDL, high density lipoprotein; INR, international normalized ratio; LDL, low density lipoprotein; MCV, mean corpuscular volume; SVR, sustained virological response. b Data are shown as mean ± SD. Categorical data are shown as n and frequencies (%). c Data are shown as median (min-max) if distributions are skewed. Mild fibrosis group, < 2 fibrosis scores; advanced fibrosis group, ≥ 2 fibrosis scores. According to our data, there was difference depending on gender, when we classified the patients according to age as 50 years and over or younger according to the biopsy date. Among patients aged ≥ 50 there were 52.2% female patients, while there were 86.9 % in the < 50 age group, (P = 0.003). Hepatic ERα expression was inversely correlated with the fibrosis stages of patients infected with HCV genotype 1b. This inverse correlation was confirmed statistically (r: -0.413; P < 0. 001). Age was directly correlated with fibrosis score (r: 0.27; P = 0.009), but there was no statistically significant correlation between gender and fibrosis (r: 0.13; P = 0.19), as seen in Table 2.
a Abbreviations: r, spearman correlation coefficient; ER, estrogen receptor; AST, aspartate aminotransferase. There were statistically significant differences regarding age, platelet counts, neutrophil counts, alanine aminotransferase (ALT), aspartate aminotransferase (AST), gamma-glutamyl transferase (GGT), and high expression of ERα among the patients in univariate analysis. The factors that were significant in univariate analyses were further analyzed by multivariate logistic regression analyses through complying with the absence of multicollinearity. Hepatic ERα expression was an independent predicting factor for liver fibrosis in patients with HCV genotype 1b (odds ratio (OR): 0.10, confidence interval (CI) 95%: 0.018-0.586, P < 0.001). The results of multivariate analyses for liver fibrosis in the HCV genotype 1b infected patients are shown in Table 3.
a Abbreviations: ER, estrogen receptor; OR, odds ratio; CI, confidence interval, AST, aspartate aminotransferase. In this retrospective study, we evaluated hepatic ERα expression among patients infected with HCV genotype 1b with high viral load, who had received the standard treatment protocol. Ninety consecutive biopsy-proven patients were divided into two subgroups according to fibrotic scores as mild and advanced fibrosis, depending on the presence of septal fibrosis. Liver ERα expression was inversely correlated with fibrotic stage, and in the advanced fibrotic group, there was less ER α expressions. In multivariate analyses, liver ERα expression continued to be an independent predicting factor of advanced liver fibrosis. This result showed that estrogen may have some protective effects on progression of chronic HCV in long term follow-ups. Estradiol acts as a powerful antioxidant which blocks lipid oxidation reactions in liver (14) and inhibits the production of active oxygen radicals and lipid peroxidation in oxidatively-influenced rat hepatocytes; on account of this, it blocks depletion of antioxidant enzymes (15). In a rat model of liver fibrogenesis, estrogens had protective effects on liver fibrosis with an evidence of a direct beneficial effect on fibrogenesis (11). Our results support the experimental data published previously which showed the antifibrotic effects of estrogen on liver as well as on other different tissues (16-18). The suboptimal response and various complications due to the currently available standard therapy led to extensive researches for novel therapies with new therapeutic approaches. Targeting host factors of HCV in the life cycle by different strategies such as nuclear receptors and other principles may be considered as novel rational options. We concluded that patients in the advanced fibrosis group were older than the mild fibrosis group and age seemed to be correlated with fibrosis stages; but in multivariate logistic regression analysis, it was not an independent factor for predicting advanced fibrosis due to chronic HCV genotype 1b. In some different studies, it has been shown that age may influence the severity of HCV (2, 19); in older patients, the disease may progress faster and also poor viral response can be seen (20), which were compatible with our results. In our study, when we classified the patients according to ≥ 50 and < 50 years of age into two groups, we could not find statistically significant differences related to fibrotic stages. Furusyo et al. in a randomized controlled study showed that administrating selective estrogen receptor modulator improved the efficacy of the standard therapy protocol, PEG-IFN α2a and RBV, for postmenopausal females infected with HCV (21). Sezaki H et al. showed that response to combined PEG-IFN and RBV therapy was poorer in females than in males with HCV aged more than 50 and they speculated that this impaired response could be related to low estrogen levels in older females (22). Our study confirmed that low estrogen expression was associated with advanced fibrosis, and perhaps with administration of selective estrogen receptor modulator, the fibrosis progression of HCV could be inhibited; but clinical studies must be carried out to prove this theory. Some viral factors such as genotype and viral loads may influence the course of HCV; for instance, genotypes 1 and 4 are less responsive than in HCV genotypes 2, 3 and 6 (23, 24). High viral loads have been related to faster progression of liver diseases and poor response to treatments (20, 25). In our study, such viral factors that can affect the course of fibrosis in chronic HCV were excluded, because all the patients had the same genotypes and high viral loads (> 5.0 log IU/mL) and received the same standard therapy protocol. Recently, we reported that there was no relationship between liver ERα and histopathological features of patients infected with HCV of any genotype and without receiving treatment (26). However, in this study, we evaluated the patients who had HCV genotype 1b and received the same treatment protocol (PEG-IFN α2a + RBV) and we concluded that there was more liver ERα expression in the mild fibrosis group compared with the advanced fibrosis group. 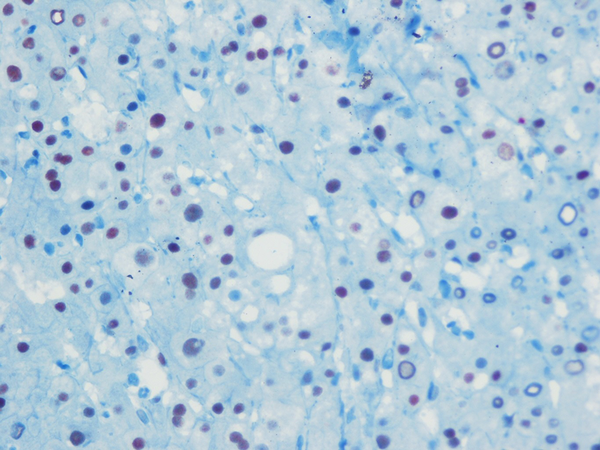 As the fibrosis group advanced, ERα expression decreased. We concluded that liver ERα may have protective and beneficial effects in addition to standard treatment protocol on HCV genotype 1b. There were some limitations for our study. All the patients were infected with genotype 1b and high viral loads. Hence, the results obtained may not be extended to patients with HCV with other genotypes and low viral loads. The lack of serum estrogen levels was a limitation of our study; therefore, we could not evaluate the relationship between the serum levels and histological expression of estrogen. Relatively, the small number of patients was a limitation of the study. In future, large population-based and prospective randomized clinical trials among different races should be carried out to evaluate the correlation between ERα and liver fibrosis and SVR in patients infected with chronic HCV genotype 1b. In conclusion, our study ensured the logical evidence that liver ERα expression may have a role in the long-term course of HCV genotype 1b in fibrosis stage and suggested a novel treatment target in addition to the standard therapy protocol. Authors’ Contributions: Concept and design, literature search, statistical analysis, writing and critical revision of the manuscript: Mustafa Cengiz. Concept, data interpretation and critical revision of the manuscript: Seren Ozenirler. Histopathological evaluation and scientific revision of the manuscript: Guldal Yılmaz.